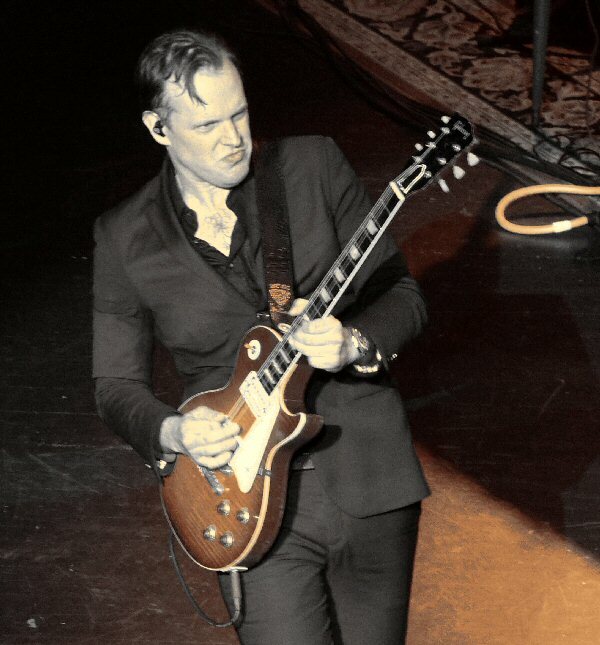 Guitar great Joe Bonamassa triumphantly returned to the Beacon Theater in New York City for a sold-out and sizzling three night engagement in May of 2013. 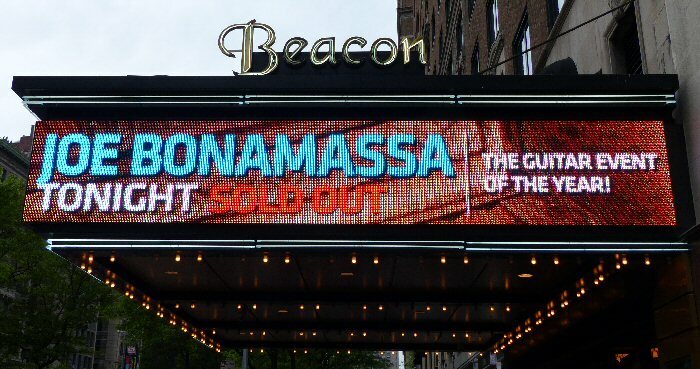 Joe Bonamassa's Beacon Theatre three night run was the guitar event of the year. Bluesman Joe Bonamassa was born in 1977 into a musical family who still runs a guitar shop in upstate New York. Joe was given his first instrument at age four. At seven, he could play note for note the music of Jimi Hendrix and Stevie Ray Vaughan. Bonamassa opened for B.B. King when he was twelve and had collaborated with many others by the time he released his debut album in 2000. Early in his career, Joe lived and struggled as a working musician in NYC, dreaming of playing at the prestigious Beacon Theater. Today, not only is Joe performing there but he had done so on multiple occasions culminating with two concerts from November of 2011 that were recorded and released in 2012 under the title Beacon Theatre: Live from New York. Bonamassa was heavily influenced by British and Irish blues with these elements still apparent in his versatile body of work. Joe is an award winning, chart topping artist who is not content to rest on his laurels. Joe plays approximately 200 shows a year and when not on tour he is still working. Bonamassa stays busy with his solo work and recent side projects with singer Beth Hart and the jazz-fusion group Rock Candy Funk Party. Joe and one of his many vintage guitars that were used during his two-hour performance at the Beacon. 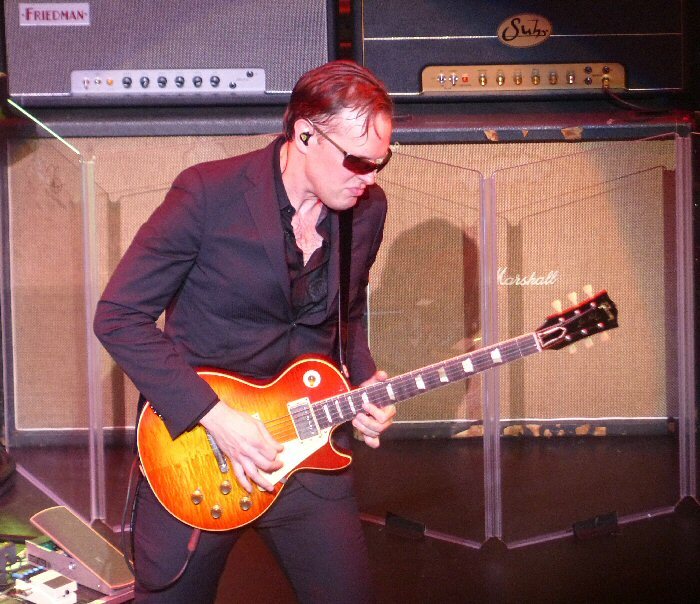 Soundpress.net caught up with Joe Bonamassa on Saturday, May 18, 2013 at the ornate Beacon Theater. County music was piped in a few minutes before Joe promptly took the stage alone at eight o'clock, showing his strong work ethic by being on time. He was dressed in a dark suit and sun glasses - always looking the pro and more importantly sounding like the well-seasoned musician that he is. "Good evening New York," Joe said as he took a seat and started the show acoustically. Joe's strumming was strong and speedy on "Palm Tree" as he tapped his foot to keep time. The band joined Bonamassa for the second acoustic number. "Seagull" soared on intense and intricate instrumentation from all the players. Fans were clapping along as the group flowed into the circling chords of "Jelly Roll" and an animated "Athens to Athens". Joe finished the acoustic set with a dynamic version of "Woke Up Dreaming". Bright lights flashed out into the venue as drummer Tal Bergman thundered on the intro of "Slow Train". Bonamassa steamed into his solos with moving lights adding to the might and momentum of the tune. "Dust Bowl" was just as dynamic as Joe stalked the stage pulling lavish leads from his Les Paul. 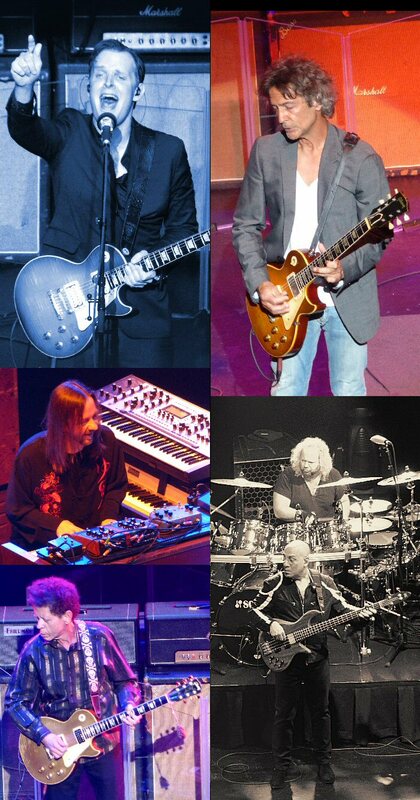 The Joe Bonamassa Band and their special guests - Billy Squier and Blondie Chaplan. "So It's Like That" was a bluesy and bold piece with the keys dominating the mix. "Midnight Blues" was pensive but as the song progressed the riffs and rhythms grew more powerful. "Who's Been Talking" was potent with its primal beats. Joe and his team were tight and they all added much texture and tones to the music. "Mountain Time" was magical with a nice mix of notes and nuances. Joe thanked the audience again and commented that it was an honor to play three capacity nights at the Beacon. Later, he would also mentioned his times of scarcity in the city and the thrill of seeing his name on the marquee. Bonamassa stated that "there was a rock & roll legend in our midst" and he invited Billy Squier to join the band on stage. Billy handled vocals on "Crossroads" with Joe stepping back so Squier could lead on guitar. The two then jammed on the Robert Johnson classic and moved into "Look Over Yonders Wall". "That was the coolest thing," enthused Joe who said "it so happens we have another guest". This cool cat has worked with The Beach Boys, The Rolling Stones and with Joe on his song "The Ballad of John Henry". Blondie Chaplin strolled out. The two guitarists sizzled as their song ran the gamut from edgy to elegant and ended the set on a high note. Returning for the encore, Joe tossed his shades and some picks into the crowd before performing the slower and more serious "Slow Gin". "Just Got Paid" was daunting with its heavy riffs and rhythms and took a daring detour into Led Zeppelin's "Dazed and Confused". The concert closed with band introductions and thanks to everyone at the Beacon. As Joe and the band lined up on stage to take a bow Bonamassa paused one final time to view the raucous fans on their feet giving the group a standing ovation. At this, Joe mouthed "WOW" and took the words right out of our mouths. Joe whipped off his sunglasses and tossed them into the crowd to kick off his encores. Bonamassa's return to the Beacon Theater on Broadway was triumphant. His three-night engagement was sold out and each show featured special guests including Warren Haynes who performed on March 16, 2013. The venue is elegant, has excellent acoustics and has become legendary as more bands such as the Allman Brothers take up residency there on a regular basis. Perhaps Bonamassa's Beacon Bonanza will become a tradition for blues' hardest working guitar great. Joe Bonamassa is seemingly always on the road.